On February 17th, 2007, Officer Tim Knoth shot Atom Lisi’s dog. Presumably, killing something in the line of duty while incurring injury would merit an entry in a personnel file. Not so, apparently. There’s no commendation, complaint, or note of any kind in Tim Knoth’s file regarding the incident. On January 20th, 2008, Officer Knoth was sent to perform a wellness check on Corey White. Corey White had some sort of emotional problems and allegedly attacked Officer Knoth who responded by shooting Corey. Officer Knoth was found to have used appropriate force by the Greene County Sheriff’s Office. Again, an injury and a shooting with no notes in his personnel file. On November 12th, 2013, Sgt. Knapp, Ofc. Roegner, and Ofc. (in training) Lieff responded to 280 North High Street in Yellow Springs after a 911 call. This incident escalated to the point where the SWAT was called and escalated to the 2013 shootout with Paul Schenk. The shoot-out was significant enough to merit an investigation by Ohio Attorney General Mike DeWine. Between Ofc. Roegner’s and Sgt. Knapp’s personnel file, the shootout is only mentioned in Ofc. Roegner’s letter of resignation. These incidents vastly contrast with Ofc. Kimpan’s personnel file where a negligent discharge of a firearm (no one was hurt) is noted on four different pages of his sixteen page file. These are very significant events in these officer’s careers that are missing from their personnel files like they never existed. Both of these incidents were under Police Chief Anthony Pettiford whose tenure spanned from November 2012 to September 2014, so the administration should be relatively consistent. Sergeant Naomi Penrod (now Watson) was suspended from the Yellow Springs Police Department for months between 2015 and 2016 and eventually reinstated with pay. This odd record keeping is even noted in a letter dated December 16th, 2015 written by Patti Bates, she notes that “The fact that the previous incidents noted herein are not in your file is problematic of system that change during my tenure.” This letter and any details of her dismissal are missing from Sgt. Watson’s personnel file. The reason that Sgt. Watson was suspended for removing a camera from Athena Fannin so she could not be recorded. The only record in her files of the event is a non-descript memo referencing a pre-disciplinary hearing. Before Ofc. Hawley was dismissed after the debacle of 2017 New Year’s Eve (and subsequently rehired at Cedarville’s PD), he arrested a personal friend of mine for filming an arrest in Yellow Springs. In court, Chief Hale testified that filming officers in uniform is legal. A request for dash cam footage from Barry Lawson’s assault on a tourist was recently submitted. Despite Chief Brian Carlson, Sgt. Naomi Watson, Sgt. Knapp (both sergeants), and Officer Dennis Nipper (the longest serving member of the YSPD) responding to the call, there was no dashcam footage of the incident. General Order 4.2 dictates that “Officers must ensure their in-car camera system is functioning properly and that each officer has synced their microphone to the in-car system.” Are none of the cruiser cameras working? Did the four most senior and supervisory officers not record anything? Yellow Springs is typically touted as a progressive community. At a recent party at the Antioch College Foundry “Sexual Consent Contracts” stating that the signatory understood that relationships needed to be voluntary and that people should be treated with respect regardless of their gender or sexuality were required. The YSPD does not seem to have the same values as the community. Within the exit interviews, Officer Jessica Frazier brings up some ominous details of her experience in the YSPD. She states that Officer Charles “does not like taking orders from women and [that] he deliberately avoids going to Sgt. Watson for anything”, and that Ofc. Charles “looks up village residents on Facebook and then attempts to strike up a relationship with them.” Ofc. Frazier specifically cites an example where Ofc. Charles “was out at Dollar General for 90 minutes conversing with a female clerk.” This seems like terrible abuse of a power dynamic. In Knapp’s entire file, the only complaints are those leveled by Jane Nipper (Ofc. Dennis Nipper’s wife). Compare this to Officer Shannon Huntsman’s personnel file wherein an unrecorded April 25th, 2010 conversation during a traffic stop is laced with suspicion: “I will submit with absolute honesty none of the conversation with the voice transmitter off was sexual, offering any gratuity, an offer of unusual personal information or deviant in any manner.”  Furthermore, Officer Huntsman “failed to observe appropriate boundaries of the supervisor / subordinate relationship” in a presumably consensual relationship. There was a complaint of sexual harassment against Ofc. Huntsman that is not in his file except by secondary mention. Why are some allegations of sexual misconduct rigorously recorded for some officers and not others? It can’t be certain that the absence of these records is purposeful. One would hope not. However, the mid-level supervisors and candidates for supervisory positions of the YSPD seem to have a predilection for suppression the documentation of their actions. Both Ofc. Roegner and Ofc. Hawley were candidates for supervisory promotion before leaving the YSPD. Sgt. Knapp and Sgt. Watson are supervisors. Pournelle’s Law can be observed in the YSPD. Yes, some of these documents are old. Yes, human error is involved. Yes, journalistic paranoia and bias could be influencing the lens through which these documents were scrutinized. The Village of Yellow Springs Document Center document center’s archives are spotty. Where are all the minutes prior to October 2015? Performance reviews are presumably annual. Or biennial. Or triennial. Why are there so few? Mr. Ken Metz has worked at for the Village since at least 2004, yet his file is only six page long. The same can be said for many other officers. Why are incredibly important--even lethal--events missing from these officer’s files? The information missing is generally the kind of information that would be critical to the history and hiring of these officers. There is a pattern of bias in these files’ deficiencies that speaks to a willing desire to withhold information and distort the record. Despite changes in village managers and police chiefs, the criteria and method of recording in the YSPD indicates that any transparency or glasnost will be a wasted effort: The source material itself is tainted. When the YSPD makes records, they record only what they desire to record. 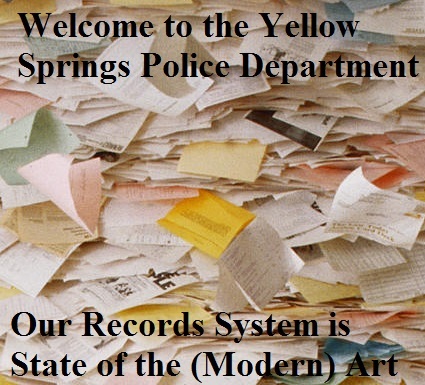 The Yellow Springs Police Department is lying about the past to posterity and therefore lying to the present. What’s the takeaway? Something is amiss, but what can’t be proved can’t be demonstrated. For the foreseeable future, the darkness between the stars holds ascendence. Don’t trust authority. Especially don’t trust the YSPD. To contact the author through encrypted means, download wickr on your phone or computer and send “stentor” a message. Alternately, please email stentor.ys@gmail.com. This dissuasion from going to Sgt. Watson could be due to the internal politics of the YSPD. In the same exit interviews Ofc. Tom Sexton notes that “he sees Sgts. Watson and Knapp communicating more effectively and often. He believes their working relationship is getting better.” Furthermore, in Sgt. Watson’s December and November 2016 emails, there is no correspondence between the two sergeants, further suggesting a schism within the department.